SECOORA Members, Catherine Edwards, University of Georgia Skidaway Institute of Oceanography (UGA SKIO), and Dr. Ruoying He, North Carolina State University (NCSU) are participating in the second annual Gliderpalooza. Gliderpalooza 2014 is running from August to November 2014. Over the months, there will be more than 30 deployments of autonomous underwater gliders, including UGA SKIO’s glider “Modena”, surveying the Western Atlantic Coastal Ocean from Newfoundland to Georgia. Modena was deployed on September 19 and retrieved October 10. Sixteen research institutions will collect extensive data of the U.S. Eastern Coastal Ocean during this peak period of fall storms. Many gliders will carry Vemco mobile transceivers, provided by Dalhousie University’s Ocean Tracking Network, to detect tagged fish and mammals as the gliders cruise the continental shelf. 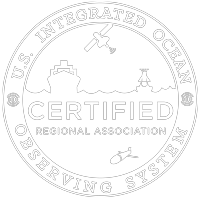 The Mid-Atlantic Regional Association Coastal Ocean Observing System (MARACOOS) is coordinating the effort. Real time locations of gliders can be followed on MARACOOS Assets Explorer here. Dr. Ruoying He and his team at NCSU is supporting the effort by providing nowcast and forecast of marine environmental conditions in the Northwest Atlantic via the Atmosphere-Ocean-Wave Coupled Model Prediction System. The system consists of a 9 km-resolution WRF model fully coupled with 7 km-resolution ROMS and SWAN models. Freshwater discharge of all major rivers and seven major tidal constituents are incorporated. The coupled system performs daily nowcasts and three-day forecasts. Model output includes sea level air pressure, 2 m air temperature, 10 m wind, surface wave height and directions, three-dimensional ocean circulation, temperature, and salinity. Model outputs in Google KMZ format allows direct blending and presentation of glider tracks with model nowcast/forecast fields. Read more on the MARACOOS blog!